At convention this summer, we were given the stamp set Workshop Words. I'm always looking for fun and creative ways to use this set, since I love it, and I think these turned out pretty darn cute! Gifts for a couple of great accomplishments on my team last month! VERY creative! I love the design! Those are some very lucky team members! Darling!! 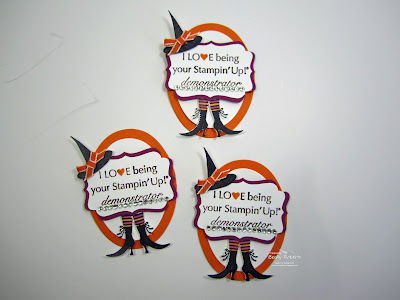 Great way to use these stamps! Super cute, Becky!! WICKEDLY...WONDERFUL!!!! I love the colors and the Halloween effect fun style!!! Creatively Cool as usual!!! And you used your favorite hat! These are really cute! Your tags are completely adorable. You did a great job! !